It's been quite some time, maybe 2 years since I posted here. You know how life goes. Anyways, I thought I would go ahead and formally throw my hat in the ring so to speak. in an effort to both reconnect as well as get some feedback on one of my projects which I am aiming to submit. I also have a few questions that I am hoping some of you guru's out there might be able to help me out with, although I'm not sure this is the right thread for said questions. I will endeavor to keep my questions as specific and concise as possible and provide visual examples as well. 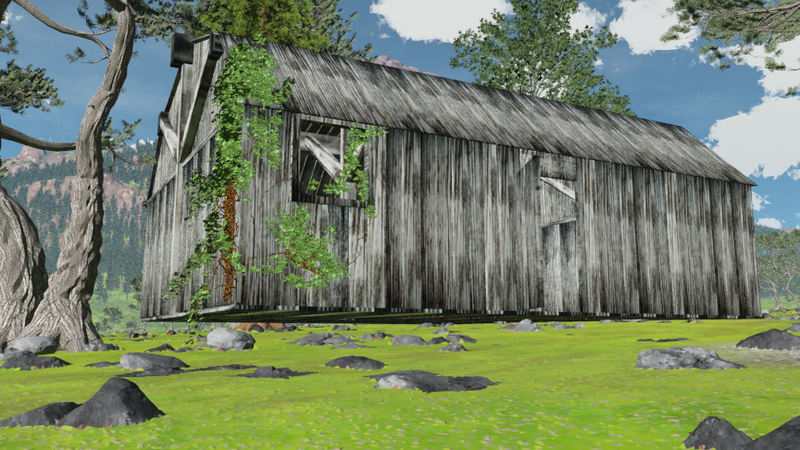 This first image is a low res visual to show the issue I am having with leveling out the ground beneath my shack. 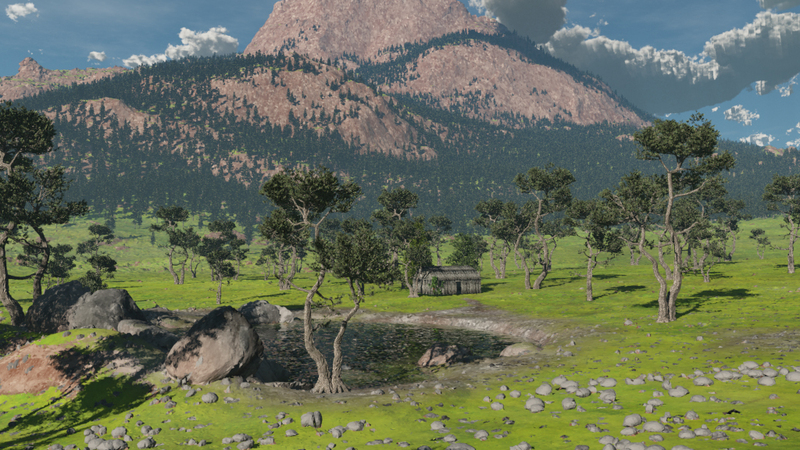 Apply an image map shader above the other terrain shaders as a displacement map. I used a black/white image map with a graduated gradient. This didn't work as the fractal displacement was still prevalent and I still could not muster a completely flat 20m x 20m area for the shack to sit on. This render was done with that image map still in place. My other lines of thinking for solving this involve, firstly, using another fractal terrain layer with all displacements set to 0, masked by either a painted shader or the same image map shader I tried to use before. My next option would be to just go ahead and model a stone foundation base for the shack in such a way that it will sit into the terrain and look right. I havent moved ahead to the point yet where I'm ready to grow my ivy for the shack and nearby trees yet because I am attempting to literally work from the ground up. Any pointers I can get that might help me solve this will be met with glee and admiration. For whatever reason the forum will not let me repost or edit my image insertions so I will have to resort to posting them as a reply to this. Please keep in mind these are process images. I am literally building from the ground up and once I introduce an asset to my scene I like to make sure that it is functioning properly and providing the desired effect before moving on to the next feature. As of now I have about 3500 plant models in but I can see this number going well above 10k before I'm done here. 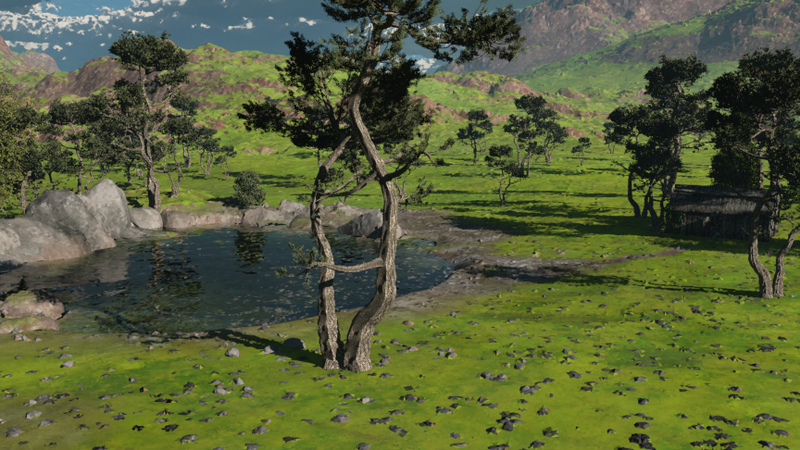 My way of leveling ground at specific spots is to smooth the initial terrain in a surface shader after the terrain, masked by a soft simple shader, then raise (by offset in the same surface shader) the terrain again until the ground is level with the rest (but has no tilt or fine displacement anymore). You can use the same mask to do different ground colors also, or you can warp the SSS for additional effects. Of course you could flatten the surface first like Ulco suggested, but imho, until you're planning to put a camera inside the shack, I think it would be absolutely enough to just move the shack down a little until there is no gap left any where. As far as I know you can find buildings like that a lot when they are placed on a steeper slope. A stone foundation would surely look good as well. Thanks Ulco I will try this tomorrow and see if I can make it work. If not Ill go with a stone foundation. In response to Hannas, yes I considered just plopping it down where it looks ok from the outside. I am after all going to cover most of it with ivy, but after careful consideration I decided that would be a lazy approach. This is for a VR end product so I do think it is important that my shack be renderable from both outside and within. I'm looking to impress those who delve into my files, not show them how adept I can be at taking the cheesy road Not to mention I built the shack specifically with Terragen in mind with the gaps in the planks etc for dramatic light effects. Ulco I will worship you forever if you can help me out with my rocks. At the moment they are barely passable and I am just not happy with them. Id say Ill show you my nodes for them but really after all my trial and error I've resorted back to just adding a power fractal for color and calling them done til I develop a better understanding. Days upon days of playing with it and I'm still at square one mostly. I follow tutorials to the letter and yet my results never look like what they are supposed to. I can't seem to get image maps to work as actual textures either or Id have tried that route then maybe used that as a displacement map but cant get it to work. There are some things that may help; smoothing the surface shader your stones are a child of, doesn't always give the best result as that smoothes any previous small displacements (like in the grass), so either you put them all together on one surface shader, and use smoothing checked, and highest raise in the merge shader that combines grass and stones. Or you can add a `tex coordinetas from XYZ' shader (other shaders) before the stones. And if you make s slight offset in the displacement fractal that drives your stones, they are blown up a bit, but don't overdo that, or the definition isn't good anymore. So for stones of 50cm, use say billows, sizes 0.2/0.5-1/0.01 and displacement 0.2 and offset 0.05-0.1. Furthermore, you can add all sorts of displacement goodies into the line before the particular rock, like a mix of strata and outcrops (very small sizes and octaves), angled, masked by PF, whatever, and a fractal warp, small sized of course, and perhaps also masked. All the help is greatly appreciated. Its still not quite up to par for my standards but here are a couple of "near final" renders. 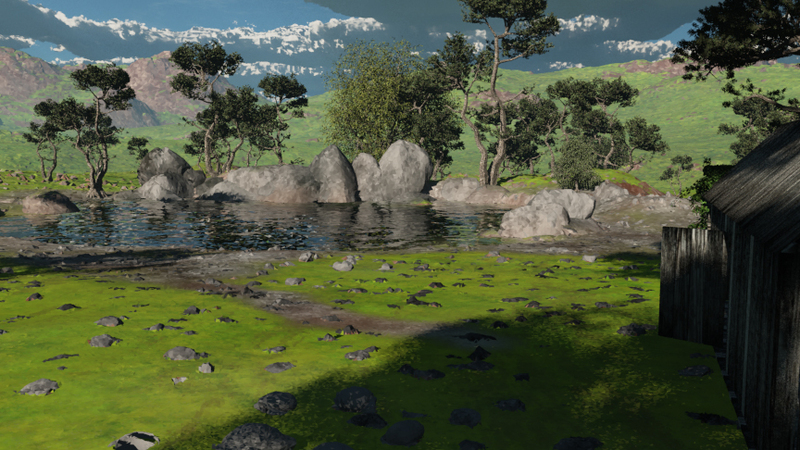 I'm not quite happy with the clouds and the lighting, nor can I decide if I'm happy with the grass either lol. Either way, time is running out and I need Sunday and Monday to crank out my final renders for submission. Critique is welcomed. (I always hate myself after I say that). Probly gonna do a render from inside the shack as well as a couple other spots if time permits. Much improved and with the extended deadline to April 11 you should be able to knock off that interior render as well. Here are my final submission images for those who care to have a look. I simply didn't have time to get my lava world scene to a level I considered worth submission but perhaps Ill do something with it for learning purposes soon. I really like it, with all the different plants. And nice rainy atmosphere in the distance.